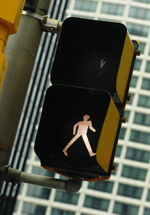 FALSE: Only under certain limited conditions does a pedestrian have the right of way. Crosswalks and walk signs don’t guarantee that you can step off the curb safely. That walk sign is just an invitation to begin thinking about crossing the street. Even when you have that walk sign, let your senses protect you. Don’t talk on your cell phone, and stop any other conversations. Don’t step off the curb until you are sure the intersection has cleared and all cars have come to a complete stop. Make eye contact with drivers to confirm that they see you. Check if any vehicle is going to make a right turn on red.